“Anticipation… is keeping me waiting…” Carly Simon was singing about heartache, not a job search. But when the hiring process drags out, job candidates can commiserate. So, why does the hiring process take so long? For all types of jobs, the hiring process now takes more than double the time it took in 2010. For white collar jobs, the average time to hire is 68 business days, according to the Society for Human Resource Management. That can feel like a lifetime when you’re on the waiting end for a job you really want or need. Hiring processes have lengthened for several reasons. For one thing, employers are requiring candidates to complete more assessments than they used to. Background checks and references have always been important for obvious reasons, but personality tests and skills assessments are common now as well. Candidates are also often asked to do presentations to committees making the hiring decision, which requires juggling multiple schedules. The shift in the job market to the need for more specialized skill sets also lengthens the search, since it shrinks the available talent pool. Our last recession taught hiring managers that they could be highly selective in choosing staff because so many people needed jobs. The current historically low unemployment rate has flipped the scenario so that now the pool of candidates is quite small. Yet many companies have gotten in the habit of holding out for perfection, sometimes expecting to find a unicorn candidate, which lengthens the hiring process unnecessarily. Delays can also happen when the hiring manager is unclear as to who the most appropriate prospects would be. A carefully crafted job description and a process designed to determine the best qualified candidates is something a recruiting firm can help the employer with, but sometimes the process is begun without that strategic preparation. How can candidates make the best of a long hiring process? Waiting to hear whether you got the job you interviewed for can be nerve-wracking. In the meantime, use these strategies, recommended by career coach Nancy Collamer in Forbes, to maintain a positive outlook and maybe even increase your chances of getting the job. Manage expectations, both your own and those of people important to you. If you are told something that sounds definite, such as “we expect to make a decision by Friday,” take it lightly rather than literally. “Employers’ plans change. A hundred things that have nothing to do with you can delay the decision,” says Collamer. A speedy interview thank you email or note will remind them of who you are and why you believe you are right for the job. If you happen to know someone who already works there, ask them to put in a good word for you. That kind of internal reference carries a lot of weight. But don’t cross the line into looking desperate or pushy. You always want to come across as respecting their process and doing what you can to assist it. Don’t shut down your search pipeline until you have received and accepted a firm offer. If you end up with a competitive offer, it might be useful to encourage the employer to speed up their decision so they don’t lose you. Be careful with this, though. You don’t want them to feel like you’re strong-arming them. They may not be able to make the decision any faster, and if you really want that job, you risk losing it. You can lessen the possibility of a long hiring process because of the hiring manager’s lack of clarity around the job description by working with a skilled recruiter. 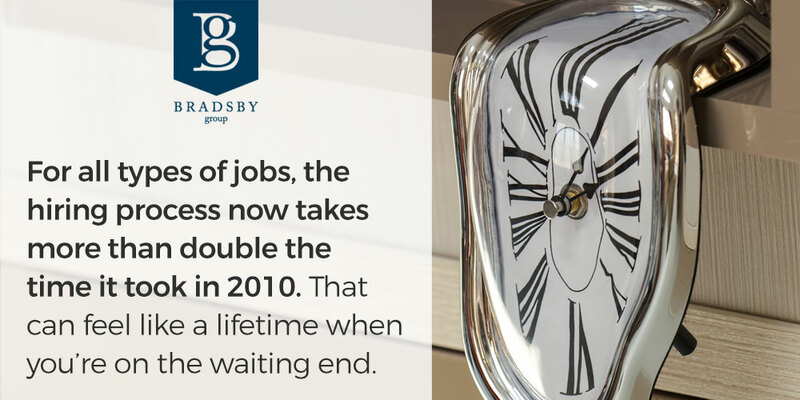 Bradsby Group prioritizes clear communication with the employers we partner with. We collaborate with them to strategize their staffing needs and develop descriptions and processes to get the best candidates to meet their needs. Reach out to our team today to begin the process. The longer you wait, the longer it will take.